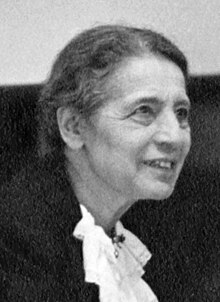 Lise Meitner (7 November 1878 – 27 October 1968) wis an Austrick-Swadish pheesicist wha worked on radioactivity an nuclear pheesics. Otto Hahn an Meitner led the smaw group o scientists wha first discovered nuclear fission o uranium when it absorbed an extra neutron; the results war published in early 1939. ↑ Sime, Ruth Lewin (1996). Lise Meitner: A Life in Physics. California studies in the history of science. 13. Berkeley, California: University of California Press. p. 1. ISBN 0-520-08906-5. ↑ Frisch, O. R. (1970). "Lise Meitner. 1878–1968". Biographical Memoirs of Fellows of the Royal Society. 16: 405–426. doi:10.1098/rsbm.1970.0016. ↑ Meitner, L.; Frisch, O. R. (1939). "Disintegration of Uranium by Neutrons: A New Type of Nuclear Reaction". Nature. 143 (3615): 239. Bibcode:1939Natur.143..239M. doi:10.1038/143239a0. . Meitner is identified as being at the Physical Institute, Academy of Sciences, Stockholm. Frisch is identified as being at the Institute of Theoretical Physics, University of Copenhagen. This page wis last eeditit on 26 Mairch 2017, at 22:57.